Seesaw Scramble (known as See-Saw Scramble in the PAL version) is the third level of World 2 found in Yoshi's New Island. 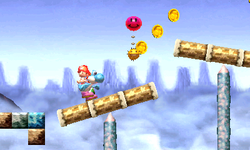 Yoshi starts the level in a rocky area with See-Saws and Item Balloons which drop projectiles. A nearby door leads to an area where Jackhammer Yoshi is introduced and must be used to arrive at another area containing the Checkpoint Ring. Soon after, Fire Wanwan Dosun start appearing from volcanoes and the player must avoid them while balancing on the See-Saws to get to the Goal Ring.